Update! Thanks to the shares and support, Sylvester has been adopted into his forever home! Congratulations Sylvester! Sylvester is a very sweet Beagle mix that was a stray who was picked up by animal control, and has been at the Habersham Humane Society ever since! He is healthy medium-size adult boy that is up to date on all his shots. He was a little scared when they first got him out of the cage, but once he was able to run around outside he was a happy camper. Sylvester loves to run around in the backyard, as well as go on long walks. He is very loving and affectionate, and loves the outdoors most of all. He is also very good on a leash. 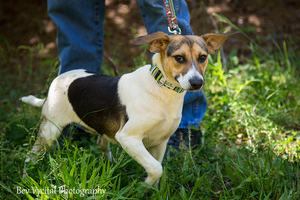 Contact Habersham Humane Society today to meet Sylvester!